I can't believe a week has gone by since our meeting and I haven't done the blog yet. As usual I forgot to take my camera and there was a lot of good work to look at today. Val was working on her Elements piece, as was most of the members. Ann's silk paper she had made was absolutely fantastic, lovely colours and shades. Pam decided she didn't like the black border she had put round her canvas work and took it out and we all agreed that it looked better. I had a great morning painting papers for my sketchbook course. Working in the village hall meant I could spread out and had plenty of room to put the paper out to dry. Go to my sketchbook blog to see the results. Time is getting short now, we are a matter of weeks away from our exhibition and I have started on my final piece. I had thought to do quite a bit of machine embroidery on this piece but it isn't going to work, I think it will be mostly hand sewing so now I am starting to panic that I have left it all a bit late. It is going fairly well though, and the effect is what I wanted. 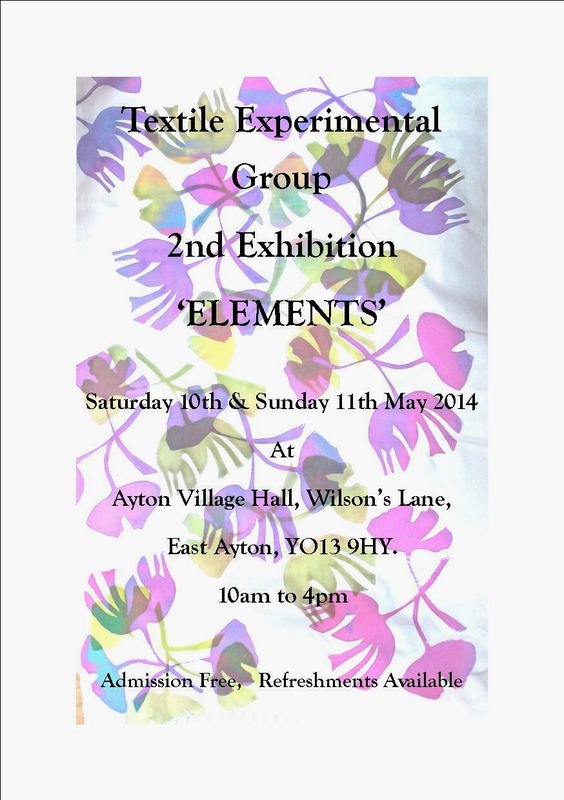 For non members of the group, here are the details of the exhibition. Hope you can read this OK, the flyers look quite good. This is a piece of work that was produced at the Dionne Swift workshop last year.